Welcome to our new sponsor, Club Jameco! Be sure to check out http://ClubJameco.com/TheAmpHour to see the kit we discussed on the show today! The storm puts electronics and electrical system reliability into sharp relief. What kind of redundancies need to be built into systems? Especially systems that are always online? In Brooklyn, they’re dealing with outages by charging with a fire-fueled charging device. Congrats to Chris Anderson who has decided to work on DIY Drones full time. We’re excited to see what they develop next! Chris (Gammell) just finished Chris (Anderson’s) new book, Makers: The New Industrial Revolution. From Dangerous Prototypes, someone has deadbugged a BGA part in his prototype! Impressive! And from their 7400 series competition, the discrete FPGA project is a cool look at how LUTs work! Does the internet prevent people from deeper knowledge about systems (out of necessity)? Dr Greg Charvat, guest on episode 115, told us about a new video that helps visualize electromagnetics waves. Awesome! Tony Long, guest on episode 107, is working on building a kit along with Greg to get more people interested in microwave. Chris now has a Raspberry Pi, but hasn’t fired it up yet. The RPi foundation is one of the first that will be open sourcing the ARM/GPU stack. ARM is now licensing and building 64-bit ARM-based server processors, including the A-53 and A-57 cores. Which US Presidential Candidate will be better for engineering? If you’re in deep to the statistics of the election, check out the 512 Paths To The Whitehouse. Chris is getting overzealous about CNC Machining, based on a great document found at the /r/hwstartups subreddit. This guerrilla guide to CNC Machining is awesome! Would you pick a CNC over a 3D printer? Paul Graham wrote an article about the Hardware Renaissance. Ben Einstein of Bolt wrote a rubuttal mentioning that the mentorship isn’t as strong. And if you’re interested in hardware accelerators, HAXLR8R is looking for their next round of candidates! The podcast that Chris mentioned is called Innovation Hub from WGBH. Great show! Thank you to Jameco for sponsoring the show! And to Nottinghack for the CNC picture! It seems to work, though I would not trust it where high reliabiliy is required. Thanks for the show, it’s was entertaining as usual. Chris, i think you’ll find if you look very very close at the main chip on your Raspberry Pi you’ll see its actually two packages. The Broadcom one is on the bottom and the Samsung RAM chip is soldered on top. Ah, I’ll have to look again! Thanks! I figured it was just integrated. CNC isn’t different from 3d printing. If you have a good cnc machine, you can just fit a 3d print head. A machine that can do “tracks between pads” can be built for less than $200. I’ve done it. I just had to pause the show and find this footage from last years insane flooding in Queensland, Australia. Dave – what are you on about??? Damn, how could I forget the QLD floods. I even paid a flood levy on this years tax return. Pretty rare though to happen on that scale in a major city here though, compared to many other countries. It’s only happened there one other time in the last 100 years. We are a country of “drought and flooding rains” of course. 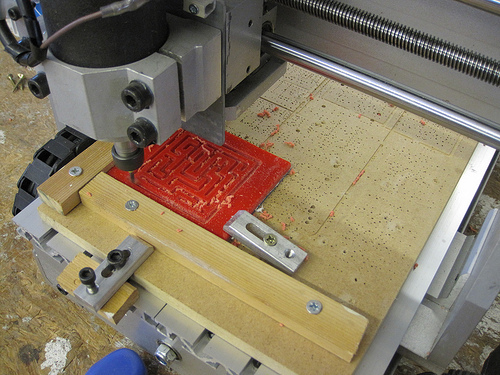 I use my CNC machines for isolation PCB milling all the time. Glad you liked my discrete FPGA project! It was a lot of fun to put together. Hey Nick, when I first saw that posted on the DP RSS, I thought it was quite genious. Everything is looking more 3D these days. Perhaps it would be interesting to build your LCs so that they can stack vertically too? Beat Xilinx, Altera and Lattice at their game! I’ll never get a 3D printer. Plastic parts all day long…. Bleh! What’s the name of that sciency/election podcast that Chris mentioned? Innovation hub, I’ll add it to the show notes, sorry I forgot. Hello! I got to your site from its ranking on Google and as a scearh optimizer I thought that I’d share this tip with you about how you could be ranking higher, there is a WordPress addon for SEO that does automated SEO for your website, automated SEO addons like this are new to the blogging scene so using this would give your site a huge increase in traffic. If you’re serious about making your blog grow and make money then check it out by clicking my name. I built my own CNC machine with a harbor freight mini-mill and LinuxCNC- the hard part I’ve found is the software to take something from idea to G-code (what most CNCs understand). The software packages I’ve found to be aimed at super basic things in a proprietary format or at professional machine shops that can amortize the very high startup. Now that I’ve got one in the area, I think a TechShop membership is overall *LOTS* cheaper. Making enclosures, gears, molds for cold casting all sound cool to me. Anyway, speak up about it, please. Again, I encourage you to do all of the leg work for me and the rest of the world, I guess.